Google is introducing another useful new feature to its Maps app. When heading to the directions screen, you’ll now see Street View images of every road you’re supposed to turn onto, making it easier to get to your destination when taking an unfamiliar route or confusing intersections. The images appear as small thumbnails next to each direction but tapping that thumbnail image will bring up the full 360-degree viewer, pointing in the direction of the turn. The feature has been available on the Maps web interface since 2008 but it’s the first time making it to the mobile app. The change was spotted by Android Police, which also reports about other minor, mostly cosmetic changes. Many screens now include a bottom bar with contextual activities, often accompanied by a button on the right side, replacing the floating action button common in the Material Design Guidelines. It takes up a bit more of the screen, but makes it clearer what tapping certain buttons will do. The Street View feature only appears to be on Android for now and it appears to have been activated remotely without the need for an update — it’s showing up in versions as far as v9.51.1. 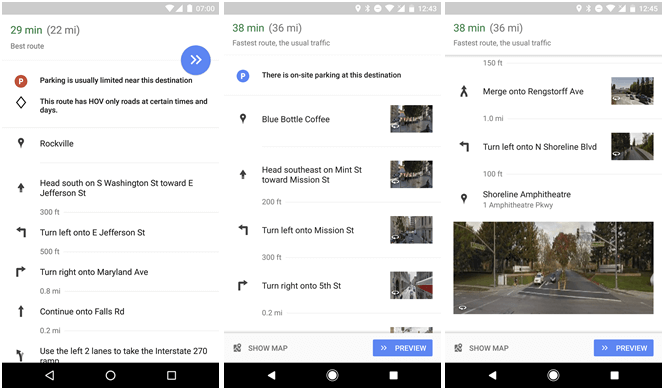 Google has kept busy adding new features to Maps in recent months, with things like real-time location and trip progression sharing, the ability to remember where you parked, find reviews for nearby restaurants, creating and sharing lists of places, and more.